Thousands of members of the public are buying the Stop HS2 Xmas Single, the Oak Tree Lament (do buy it – it’s a great protest song). 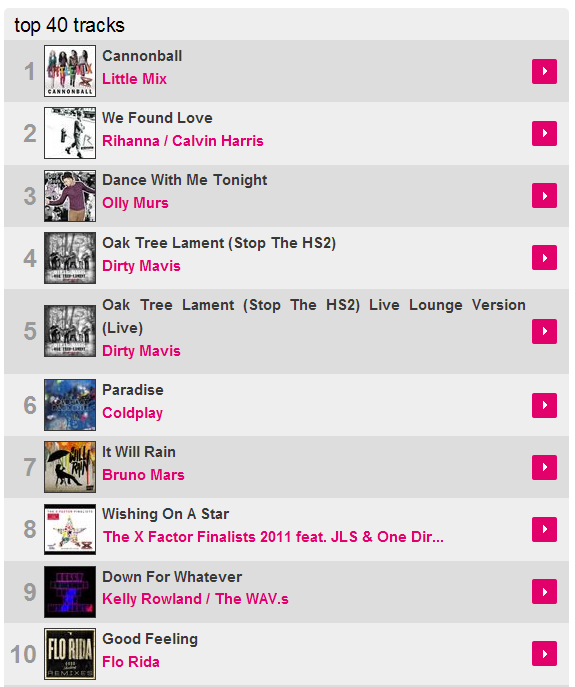 It was in the Top 5 of the HMV Download Chart today ahead of Coldplay. The Great British Public do not want HS2. A brand new YouGov Poll has shown only 26% of people are in favour of HS2. With the majority of voters of all the 3 main political parties against it. Just like the petition with 108,000 signatures against HS2 delivered to Downing St, whilst the pathetic Yes to HS2 petition gathered less than 500 across the country and then simply disappeared! This Sunday a Construction industry leader slated HS2’s job creation ability in the Sunday Times stating that this is the wrong kind of project to create local sustainable jobs. The DfT lost another Senior Official this week after they attended a Nazi themed party. The Secretary of State could not answer questions about why Freedom of Information requests on loadings have not been answered at the Transport Select Committee and possibly slipped up by saying “HS2 is an incredibly important project” instead of “could be” despite stating that the decision-making process is ongoing. They are also still unable to explain how they can run 18 trains an hour each way without which their business case starts to collapse (even further). The Economist has urged Justine Greening to think again during the delay to her decision. Not about a tunnel here or there but the whole thing! Sir Christopher Foster (a cost-benefit for transport pioneer) has stated in an article in Transport Xtra that no reputable economist supports HS2. It’s claimed capacity is the killer argument for HS2 but independently verified figures very recently sent to Justine Greening by HS2 Action Alliance show many trains are running less than half full at peak times. Will she step up and investigate why she and the public have not got the the best possible data? If I was Justine Greening I think I would feel pretty lumbered with this nightmare project but if she gave the regions the transport they need such as the Northern Hub and upgraded quickly and cost-effectively the trouble spots on the WCML she could really make a difference to the public purse and the priorities of the British Government. Will she be brave enough? The delay she has given herself does not suggest time for major changes to the proposals and the proper consideration the Transport Select Committee recommended.